The Czech Republic lies between 48° 33' 13'' and 51° 03' 26'' North, and 12° 05' 33'' and 18° 51' 56'' East. The Czech Republic lies in the temperate zone of Europe with a regular weather pattern and no great extremes during winter or summer. Despite the small area of the country, the climate exhibits important local differences, based on altitudinal diversity and the position of mountain ranges in relation to the prevailing west winds. In general, the lowlands are dry and warm, and mountain regions are cold and humid. On the Czech Republic territory was found till 158 Scarabaeoidea species. Further several species living on this territory become extinct in the past. This concern species Geotrupes mutator (Marsham, 1802), Lethrus apterus (Laxmann, 1770) and Gymnopleurus geoffroyi (Füessly, 1775). On the other hand Aphodius scrutator (Herbst, 1789), Aphodius borealis Gyllenhal 1827, Oxythyrea funesta (Poda, 1761) are found more frequently as in the past. Some species have their northern extend frontier here and be found rare. Fore some I mention at least Miltotrogus nocturnus Nonveiller, 1958. Interesting is the occurence of Aphodius hoberlandti Tesař, 1945 species, know from southern Moravia, Austria and Hungary only. 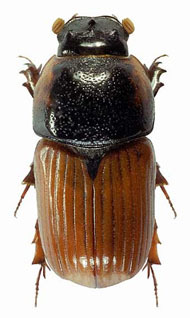 Attention deserves also the occurence of Aphodius limbolarius Reitter, 1892 living on the highest Moravia mountain Praděd. Are you interested in some species I offre the exchange.